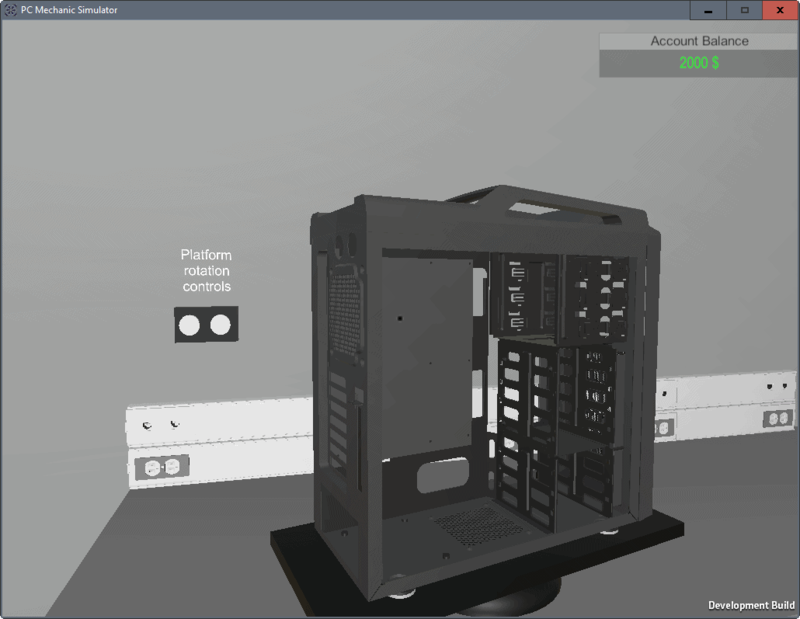 PC Building Simulator is a game for Windows and Linux devices in which you simulate the building of desktop computer systems. Building PCs, as opposed to buying them out of the box, can be a very rewarding experience. Apart from gaining knowledge on how the PC works, it allows you to pick the components and layout that you want. The process can also be intimidating, especially if you have never built a PC before. Things can, and probably will, go wrong, and the worst that can happen is that components get damaged. Select online retailers offer services in which they assemble and test the PC based on the components that you have picked. PC Building Simulator has been released as a very early pre-alpha version. The main idea behind the game is to build your own desktop PC. The released version only features the tutorial at this point. It displays an empty PC tower that you can walk around, and rotate. You can select components from the inventory with a tap on the i-key on the keyboard. Components are fairly limited right now, but support for more options will be added as development progresses. All that is available right now is to pick a component, and place it in the PC. You repeat the process for components that you want to add, e.g. cpu, memory, video card, and hard drives. The tutorial walks you through those steps, one component at a time. There is little else that you can do right now. The reason why I'm writing about this is that it could lead to some exciting options for users who are interested in PC building. While it may be useful already, as you see where each component goes, future versions could turn the rudimentary game into a real simulator. Imagine using it to pick any component from the vast inventory of retailers such as Newegg starting with the PC Tower. You could see if the components fit in the tower, if there is enough room for the video card. The game could then simulate compatibility of components, or airflow, to give you an even better understanding of what you have built so far. While I'd really like that, it seems likely that the developer will go down the "game" route instead. Still, even that could be useful for users who never assembled a PC before and want to know more about it without paying hundreds or even thousands of Dollars for components at that stage in the learning process. You can grab the early alpha build from here. It is available for Windows and Linux. Now You: Do you build your own PCs? Sounds very good, if it works accurately. If it is sponsored and got official parts to test a build with various chosen parts before buying: GREAT. Else…i totally don’t see the point. And i LOVE to build PCs. This could be great for checking CPU cooler and memory clearances. PC Parts Picker should sponsor that project. Although I’m not sure what the point of actually showing a physical PC is. You could just as easily specify a build and have the engineering specs checked and reported as to any issue. Most of the time the only real issues are things like the length of the video card disabling access to SATA ports (a problem I had with my current machine which necessitated buying a shorter video card) or other necessary components, or a CPU cooler that is too big and blocks access to RAM cards, and the like. For the latter, you’d not only have to know the dimensions of the cooler and the RAM sticks, you’d have to know the exact distance from the CPU to the RAM slots. Not sure that information would be readily available even from the manufacturer. My principles are to start with the biggest case you can afford, to allow room to work without bleeding fingers. Then pick the “roomiest” motherboard that fits the case based on actual reviews of the board that usually reveal issues. Then make sure of the dimensions of any CPU cooler used so RAM is not an issue. Then get the shortest video card to avoid component blocking issues. The other main issue with the case is how many hard drives will it hold and in what orientation and whether toolless or not. A lot of cases these days are made to hold only two drives. I insist on at least three since I don’t want to have to spend a premium for a very large capacity hard drive to replace one of the two if I exceed the space of two reasonably priced drives (today that would be 2TB drives.) I’m in the process of slowly replacing my previous three 2TB drives with 4TB drives over time. Having to go with 6TB or 8TB to get 12TB would be expensive (although I see prices have come down considerably recently.) But 2TB drives are under $100 and 4TB drives are around $120-180. I know that another 2TB will last me at least a year to 18 months so replacing a 2TB drive with 4TB buys me another year or more. The other major issue with cases is air flow. You want a case with at least two fans (one in the front, one in the back) and preferably three or more depending on the speed (and thus heat) of the CPU, so connectors and holes for at least three or four. Another issue is cable management. The more components you have with cables, the worse that gets. The worst is hard drives. A box with five or more hard drives plus a DVD drive is a nightmare of cables. The SATA cables will clump up at the SATA connectors on the board, and the power cables won’t reach from the power supply without extenders. This can be a real mess and most “cable management” just doesn’t handle it. The more fans you have and multiple video cards don’t help with cable management, either. Pretty much everything else is not terribly important. As long as your motherboard supports the technologies you want (M.2, USB 3.1, etc.) or has the performance you need for niche activities like gaming, any of the major players products will usually serve. RAM compatibility is usually easy to determine on the manufacturer’s or retailers’ Web sites. Some people obsess over “quiet” PCs so that might be an issue for some in choosing a case. My case is usually relatively quiet except for some fan noise which I don’t mind but occasionally things start to “whine” and I have to hit it to tell it to shut up. :-) By all means get those rubber fan standoffs so your fans are separated from your case walls and make sure your cables aren’t sitting on your CPU or video card fan. The other important factor is a good power supply with sufficient power to run everything you throw in the box and then some. Never buy 300-350-watt power supplies from no-name companies or retailers like Best Buy. Get a name brand power supply from Corsair or Thermaltake with a minimum 500 watts. With a high-power video card and fast multiple drives, go for 600-750 watts. When I installed a third SATA drive in my box, my power supply was a Dynex brand at 500 watts. It wouldn’t run the three drives until I juggled the power cables around so one cable wasn’t powering two drives. My next build will be running a 750watt power supply which should be more than enough for three drives and an SSD. Building a PC isn’t that hard as long as you watch out for the things listed above. It usually ends up being put that thing in the box, screw it down, connect the cables, repeat until done. As long as your components are chosen carefully, the actual build is usually easy. If it doesn’t boot, it usually means you didn’t connect something correctly or your motherboard is not screwed down right. Damaged components are rare unless you really screwed something up. Just read the motherboard manual and do it right.